One of the most under-covered (and underrated) books on investing is Cash Return on Capital Invested: Ten Years of Investment Analysis with the CROCI Economic Profit Model. As the name suggests it’s a pretty dry and technical read, but if you’re really interested in picking stocks for the long-run and don’t mind a bit of maths then it’s quite revealing. Anyhow the book features a plethora of real-life examples to back up the author’s ideas but the one that caught my eye most was that of U.K. fashion retailer Next (LON:NXT). Now retailers are usually shares that I don’t consider outside of cyclical plays due to their potential long-term vunerability to consumer and technological trends (especially apparel retailers). That said there are two points that really stick out in this case. The first is that Next generate almost crazy levels of underlying profitability relative to the competition. We’re talking about operating margins of around 20% and average returns on capital in the 50-60% region. The second thing is the sheer scale of returns that the stock has delivered over the past couple of decades. A £100,000 investment in Next stock made at the turn of the century would currently be worth approximately £835,000 (and that’s not even including the mountain of dividend cash that the company have paid out in the intervening period either) with a current year dividend yield on cost in the 30% region. It also happens to represent a serious case study in bear market investing. As a cyclical stock exposed to U.K. retailers it won’t surprise you to know that the shares got absolutely hammered during the global financial crisis. At their pre-crash peak in the spring of 2007 Next shares were trading on the market for around £23 per share. By the same point a a year later they were down to around £12 a share, and went on to trade as low as £7.90 per share in July. The galling thing was that, at first glance at least, you couldn’t really say they were massively overvalued back in 2007. Over the full year the company brought in £1.46 in earnings-per-share which valued them at 16x annual earnings at the peak. Over calendar year 2008 the company would go on to make £1.56 a share in net income (for the financial year ended January 30, 2009); putting the stock at an ultra-cheap 7.7x annual earnings at the May share price of £12. Oh, and you got a £0.55 per share dividend (4.60% yield) that year as well. If you were fortunate enough to invest at the absolute nadir in July of 2008 then you would have been looking at the stock trading at 5x annual earnings with a 7% cash dividend yield covered 3x by net profits. It doesn’t need spelling out how attractive that proposition was but investing in these types of stocks during bear markets basically boils down to three things. Firstly, the valuation is guaranteed to work in your favor over even a medium-term investing horizon when you’re looking at a P/E ratio of between 5x and 8x annual earnings. A move back to a valuation of 13x annual earnings from 8x earnings over a five year stretch, for example, would have generated annual share price appreciation of just under 12%. The second point is what happens when you factor in some modest growth and cash dividends. This is where it can get super attractive because if the company even moderately exceed expectations you can end up with spectacular shareholders returns once you throw in cash dividends and stock buybacks. This is pretty much exactly what has happened at Next. For the year ended January 30, 2016, the company reported earnings-per-share of £4.43 versus £1.56 a share back in January of 2009. That’s annual growth of 16%; pretty amazing for a FTSE 100 retail stock tied to the U.K. market. The post-2009 recent history provides some useful context to the stock’s current situation. At this point last year you would’ve been looking at a share price of approximately £75 with £1.58 in cash dividends declared during the financial year (excluding special dividends). A couple of months later the company would go on to report that net earnings over the year came to £4.43 per share. In other words prospective investors at the peak were looking at a P/E ratio of 17 and a prior year dividend yield of 2.1% (again excluding special dividends). Since then the shares are down by 35% to the current price of around £48.50 on the back of tough trading conditions. Analyst profit forecasts have slumped and the company’s most recent trading statement indicates that annual sales will come in at the lower end of previous guidance. This is always an issue when a big part of recent shareholder returns have come from an expanding valuation multiple, especially with retailers and cyclical stocks. The thing with Next is that a significant chunk of earnings growth has come in the form of expanding margins and share buybacks rather than the top line (not surprising since they have something like 500 stores and generate most of their sales in the U.K.). In the year ended January 2011 for example the company brought in revenue of £3.2 billion. Last year it was in the region of £4.20 billion – equivalent to 5% compounded annual growth over the past five years. 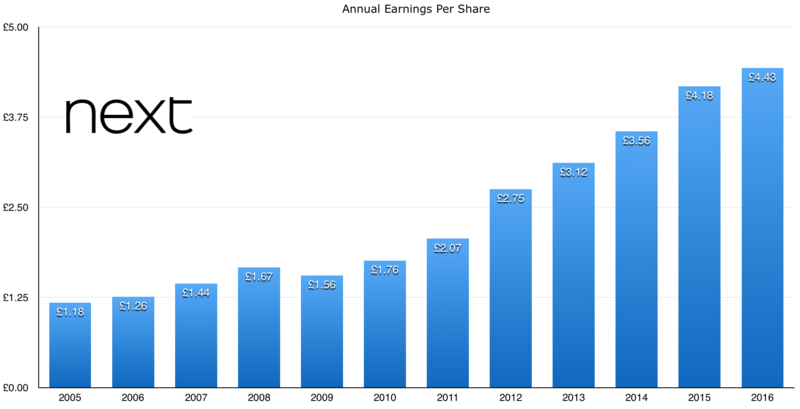 In comparison, earnings-per-share have gone from £2.75 to £4.40 during that period (or a rate of 9.85% annually over the past five years). 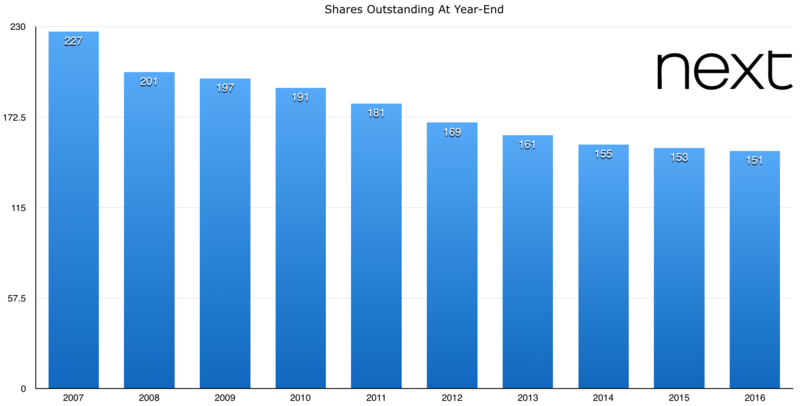 Just to give you some idea of how much share buybacks have contributed to that you only need to see that Next have retired a whopping 33% of the float since 2007 (equivalent to a rate of about 4.4% a year on average). It’s not a bad thing – in fact it’s testament to how insanely profitable the underlying business is (plus how relatively cheap the shares were). But when it gets to paying 17x earnings for a retailer there’s always the danger of a sharp multiple contraction when it comes to facing some bumps in the road. Specifically in this case we’ve got issue with Next Directory (the online arm of the business) plus the generally tough economic conditions facing high street retailers (all highly depended on the financial health of U.K. consumers). What Next For Next Plc Shares? In the past Next Directory was the key driver of sales growth. Between 2007 and 2016 it has averaged 12.4% annual profit growth compared to 2.85% for the company’s retail stores. Today you’ve got increasing competition from the likes of ASOS and the traditional retailers that are slowly catching up to the online shopping revolution. That puts the growth side of the equation into context, with the likelihood being that the last decade’s average annual earnings growth of 13% won’t be repeated. There’s also that small matter of Brexit which may or may not have a large effect on consumer spending habits. The question then is what is a good price to pay for the stock? Remember this is an obscenely profitable company relative to their high street (and online) peers. The company sport 20% operating margins and 50-60% returns on capital. Their cost control and logistical operations are second-to-none. At 11x estimated earnings you’re somewhere in the average over the past decade; the point where you don’t need to rely on massive amounts of earnings growth in order to generate decent shareholder returns. The prior year ordinary dividend of £1.58 gives the stock an 3.25% dividend yield covered 2.8x times by annual earnings. Throw in a continuation of the tremendous rate of share buybacks and you can see that it won’t take much to get decent returns at this valuation, despite the admittedly choppy trading outlook.